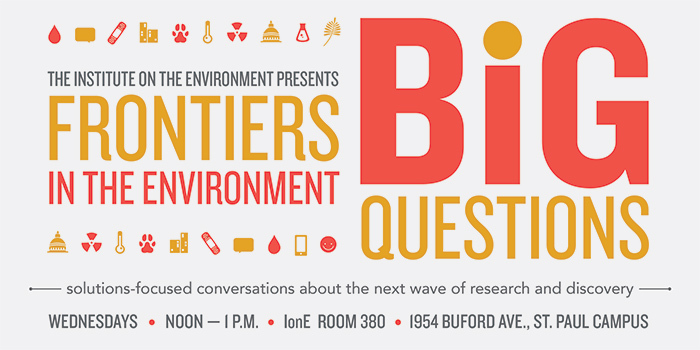 The Frontiers in the Environment series presented by the Institute on the Environment features University of Minnesota experts including Energy Transition Lab Faculty Director Hari Osofsky. The 1 hour presentations are free, open to the public, and do not require registration. Live streaming of the event will now be served up using WebEx. Before you begin, follow the WebEx Instructions. September 30 — Should we eat meat? Meat production and consumption have been blamed for everything from deforestation and increased greenhouse gas emissions to water pollution and disease transmission. Yet environmental groups and individuals who will gladly admonish you to switch your light bulbs, buy green power and drive less to save the planet, are remarkably tight-lipped when it comes to talking about what to eat. And, ironically, as we’re hearing more about the downsides of meat, carnivores have dug in their heels, promulgating protein-rich paleo diets and patronizing upscale charcuteries. This panel discussion will delve into the science, nutrition, history and future of meat production and consumption. We’ll explore questions such as: What is the impact of global meat production on the environment? What can past historical trends regarding meat consumption teach us about the future? What are the pros and cons of consuming animal products? Why do some people forgo meat? And why do others refuse to? What, if anything, is the “right” thing to do, and why? October 7 –– Why do we need community solar? We have recently seen solar energy become competitive with natural gas for electricity production in the U.S. This places us at a tipping point for solar to transform the U.S. energy landscape over the next few years. What will this solar landscape look like? Is our current system of large-scale utilities sufficient to take advantage of this window of opportunity to make solar a key tool in the transition to renewable energy production? What does community solar add to this transition? Who defines what community solar is and for what purposes? Milun will explore these questions and the role of community solar in the big picture of solar energy production, providing examples from her fieldwork in Arizona and Minnesota as founder and director of the Solar Commons, a community solar project that won a U.S. Green Building Council award. October 14 — How can spatial thinking solve environmental grand challenges? In this talk we will describe how the Institute on the Environment and University of Minnesota are global leaders in spatial scholarship and education for meeting environmental grand challenges. We’ll provide an overview of the fast-increasing importance of spatial thinking across the humanities, policy realms, and social, natural and information sciences. We will discuss spatial research, teaching and service on campus, and showcase exciting projects that use spatial data, analysis, visualization and thinking to address environmental grand challenges. We will draw on work from almost every college on campus, with special emphasis on work at IonE. October 21 — Can we save biodiversity from climate change? 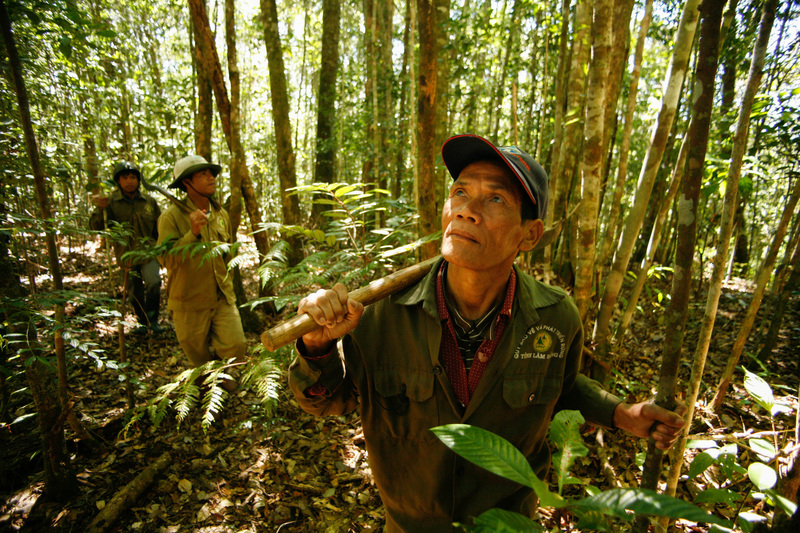 Conservation biology is charged with deploying science to stem the tide of biodiversity loss. It’s a relatively young field, yet it has many established paradigms and protocols for dealing with problems such as habitat loss and degradation, invasive species, and over-harvesting. A new threat is building steam, however: climate change. Even if global carbon emissions slow and eventually decline, climate change is expected to be a dominant force molding species distributions and ecosystem composition in the coming decades. With its global scope and ubiquitous effects, climate change is unlike many other environmental factors, and some of our most prized conservation strategies might not be up to the task. This Frontiers talk will explore some of the unique features of climate change from the perspective of biodiversity conservation — features that invite us to consider new conservation tools that must be evaluated scientifically as well as economically and ethically. As a bonus, the talk will expand from a biodiversity focus to broader questions about the goals and purposes of the IonE form the perspective of its new director. October 28 — How should we “green” our most vulnerable communities? The environmental justice movement has drawn attention to the impacts of pollution and dis-amenities (factories, roads) on low income and traditionally marginalized populations in urban areas. These communities face a triple whammy of risks: the people who live there are more vulnerable, they live in lower quality housing, and they are located in areas with greater environmental risks and greater exposure to pollution. For people in these communities, the environment may seem like a liability rather than an asset. Urban streams are sometimes polluted or filled with garbage and crime can cause parks to be perceived as places to avoid rather than recreational amenities. At the same time, trees provide shade reducing energy costs and gardens, parks and green spaces offer cultural and aesthetic value. In this panel, we will explore the evidence for links between urban nature and the health and well-being of urban residents — both positive and negative — and what this means for the greening of neighborhoods in the Twin Cities. We will also hear from community leaders about successes and challenges associated with infrastructure costs, green housing, urban redevelopment and the equitable distribution of nature in the city. November 4 — Can hybrid cooperation make Arctic offshore drilling safer? The rapid pace of Arctic melting has made the region’s massive oil and gas resources increasingly accessible. The Obama Administration’s 2015 decision to issue proposed rules for Arctic offshore oil and gas exploration and to provide conditional approval of Shell Oil’s Chukchi Sea drilling plans reinforce the Arctic as an expanding frontier. In this talk we will explore how “hybrid cooperation” can serve as a critical tool for addressing these regulatory and governance challenges. In this form of cooperation, diverse stakeholders at multiple levels of government intertwine their efforts, either through creating institutions that bring them together or through integrating each other’s work in the agreements and regulations they develop. The talk will examine examples at transnational, national and subnational levels of cooperation and explore their benefits and limitations. These instances serve as important examples of possible pathways forward in this context and other complex governance contexts. November 11 — When does conservation mean killing? Invasive species are a global issue with direct impacts on biodiversity. Protecting biodiversity through conservation can be an inexact science and a dirty proposition in a race against time — a high stakes contest to save species, protect populations and preserve biodiversity. With these high stakes come ethical questions. This presentation will explore: When is it right to kill one species to protect another? Do the ends justify the means? What is an acceptable level of knowledge for taking action in a world of data gaps and limited resources? 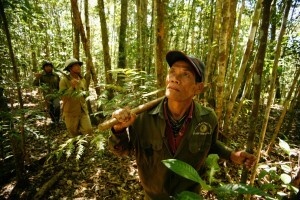 What actions are justified in the name of conservation and protection of biodiversity? Who picks the winners and the losers? November 18 — Are robots a boon or a bust in scientific research? Robots are increasingly being put to scientific purposes. Autonomous aerial, ground and surface vehicles are used to assess fertilizer levels in cornfields and yield estimates for apple orchards. They are also being used in a variety of wildlife management and conservation situations, such as monitoring invasive fish and tracking free-roaming wildlife. A recent study, however, found bears to have an adverse reaction to drones in their environment. In this presentation, we will discuss the benefits and drawbacks of this evolving technology. December 2 — Does competition promote planet-saving innovation? Can competition between companies encourage innovations in sustainability that have the potential to solve some of the world’s grand challenges? Using a series of case studies from his recent book, Innovations in Sustainability, Marcus will examine the progress, obstacles, competition and evolution of sustainable innovations in such companies as Tesla, General Motors, Toyota, General Mills, Kellogg, Whole Foods and Walmart, reflecting on lessons learned and shedding light on the challenges that lie ahead. December 9 — Can energy use data reduce electricity costs and environmental impacts? As state and local governments and electricity users attempt to improve the efficiency of their buildings, reduce greenhouse gas emissions and realize the promises of improved demand-side management of energy resources, the need for electricity and other energy-related data becomes ever more pressing. Yet current law allows companies to keep a significant amount of energy use data confidential. In this talk we will draw lessons from the more sophisticated legal frameworks governing health care, education and environmental emissions data that balance public policy needs for data evaluation with privacy interests. A review of the law in these fields shows that the privacy and confidentiality interests in energy consumption data may be overstated and, in any event, can be adequately addressed in most instances by aggregating the data, using historic rather than current data, or developing contracts and other agreements to ensure security where access to individualized data is needed.